Addon Requirements: Board3 Portal 2.1.0 and newer. 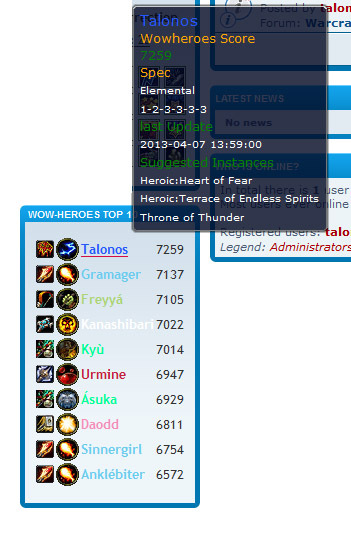 2. navigate to Extensions -> Portal -> Portal Modules and click "Add Module" for any side column and add WOW-Heroes Top10. 3. now configure your installed module to your liking by clicking on the . added better error outputs so it doesn't break things. more stabile linking to wow-heroes for accented characters. Bug fix: link direction now sends you to the right page on wow-heroes. I tried this extension on my board but when I activated it I had a blank page and now got that blank page on all page : Index, Board, Forum, ACP to. I can not do anything. Same thing if I delete the "b3pwowheroes" on the FTP. There is a way to disable the extension with only access to the FTP server ? The others extensions like WoW Guild Recrutement work fine. I tried but it does not work, same issue. edit : so, resolved with a delete of "b3pwowheroes" folder + clean "cache" folder. Thanks. ensure spelling is correct (case sensitive) and also ensure your guild shows up on the wow-heroes website. yeah it shows on the site and the spelling is the same as i did there. still dont work. i take it this one dont work like the others and use an api ? right ? cause it don't have an input spot for one. Tested and still the same and if you look at my site the rest is working its just that wow heroes but yet my guild shows on their website. dose wow heroes pull the api from the realm one ?